20.52.003 Design review and historic preservation board review. The MX-DRO design review overlay zone is established. Properties so designated shall be subject to the provisions contained in this chapter. (Ord. 3132 § 1 (Exh. E), 2017; Ord. 2993 § 3 (Exh. H), 2011). The provisions contained in this chapter apply to all new commercial and mixed-use development and exterior additions, exterior expansions or exterior remodeling related to an existing building, where said new development, exterior addition, exterior expansions or exterior remodeling related to an existing building is directly visible from a public street (if it will be visible for more than three years beyond the date of construction completion). Any exterior additions, exterior expansions or exterior remodeling related to the enclosed regional shopping center structure shall be exempt. (Ord. 3132 § 1 (Exh. E), 2017). New structures over 4,000 square feet are subject to review and approval by the design review and historic preservation board. (Ord. 3132 § 1 (Exh. E), 2017). (1) Support and reinforce the purpose of the city’s mixed-use zones and associated subarea plans, where applicable. (2) Repealed by Ord. 3132. (3) Create compact, mixed-use, multi-modal redevelopment that helps to create and establish a nodal destination point for the community and east Pierce County at large. (4) Allow building heights that create space for a critical mass of people needed to make a new urban neighborhood successful. Ensure that development is human in scale at the pedestrian level. (5) In the River Road mixed use (RMX) zone, to embrace and integrate the Riverwalk Trail system as a focal point of access and building orientation and accentuate River Road as a gateway to the city. (6) Incorporate “green” design, smart growth policies, and sustainable technology into the urban design, site plan design and architectural designs. (7) To ensure top quality design and pedestrian orientation in the layout and planning of redevelopment. (8) Use sustainable building materials and construction methods (e.g., LEED) that are of the highest quality and appropriate to an urban environment and expected to last at least 50 years. (9) Adaptively reuse existing buildings. (10) To promote and establish a coordinated system of internal roadways and nonmotorized pathways and plazas throughout the MX zones. (11) To mitigate the potential impacts of taller buildings than what is normally observed in the development patterns of the community. (Ord. 3132 § 1 (Exh. E), 2017; Ord. 2993 § 3 (Exh. H), 2011). (1) Urban Form. All development in the MX design review overlay zone shall reflect the area’s vision of a pedestrian-oriented environment by establishing a high quality, compact urban node in the community. 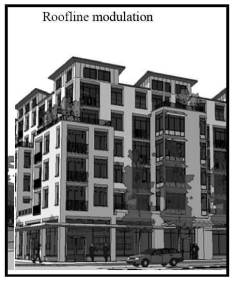 (a) Allow and promote larger scaled mixed-use buildings that provide careful attention to thoughtful/sensitive transition designs that respect and protect adjacent smaller scale residential uses. (b) New development should seek to incorporate a mix of residential, retail, commercial and open space uses of various types and scales in order to serve the neighborhood, the city and the region. 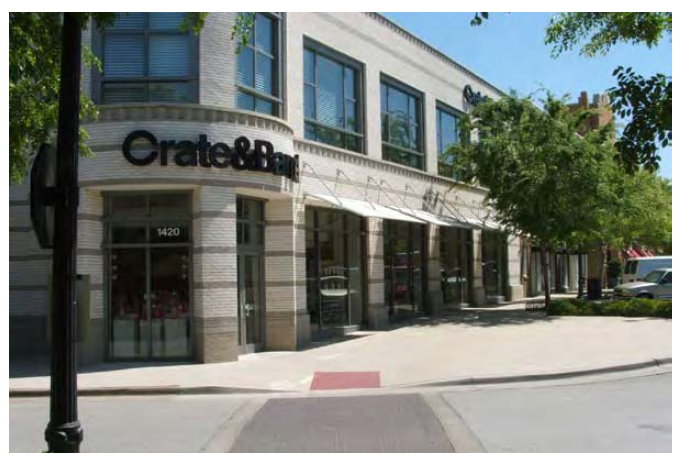 (c) Incorporate multiple building features such as cornices, special wall-mounted lighting fixtures, window shutters, planter boxes, various window styles and other elements to reinforce the pedestrian scale, ground floor orientation and visual continuity to abutting buildings. (2) Architectural Design. New development may be a variety of architectural styles, with a focus on the use of innovative, sustainable building materials and design practices, such as LEED. Architectural designs shall seek to promote a high quality architectural theme that minimizes the bulk and scale of compact development. 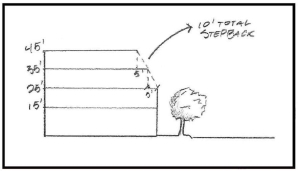 (a) Mitigation of potential impacts related to larger building heights using appropriate massing, upper floor step-backs, materials, modulations and details and design of the facade at the pedestrian level shall be a primary objective of building design. (b) Use of high quality, sustainable building materials and utilization of sustainable design practices – such as LEED – are to be incorporated into site and building design. (c) Large expanses of undifferentiated facades are not allowed along public rights-of-way. The composition of a proposed building facade shall be defined by horizontal and vertical modulation and articulation, with vertical articulation being predominant. (d) New buildings that are three stories or higher shall have three visual design components: base, middle, and top. The base shall provide a scale and articulation that is related directly to the pedestrian, including elements appearing in other components (e.g., appropriate fenestration). The middle portion of the building shall provide a pattern of fenestration, texture, and detail that lends a sense of rhythm and scale to a building both horizontally and vertically. The top portion of the facade shall typically receive special treatment that terminates the building in a distinctive manner. (e) Blank, flat, unadorned, or repetitive facades shall not be allowed on facades visible from public rights-of-way, or the Riverwalk Trail in the RMX zone district. 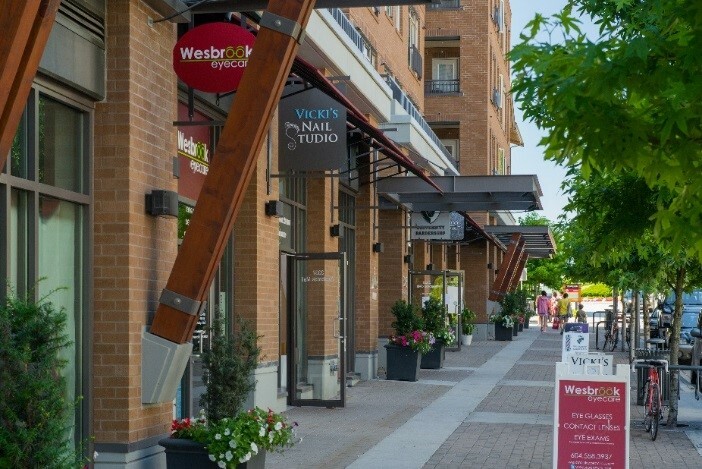 Facades visible from public rights-of-way and multi-use trails shall incorporate design elements that break the facades into components scaled to the pedestrian, and to the context of other buildings on the street. (f) All buildings shall maintain a pedestrian scale through the use of building elements at the street level such as windows, entries, commercial displays, building entries, a variety of materials, colors, ornamentation, texture, elements indicating floor-to-floor heights, appropriately scaled building materials, cornice lines, signage, awnings and canopies. Ground floor facades that face public streets shall actively engage pedestrians through such features listed above. (3) Pedestrian Orientation. All development in the overlay shall establish a pedestrian-scaled environment within compact development patterns that is urban in scale and form. (vi) Trees and landscaping, street furniture, and pedestrian-scaled lighting fixtures and amenities, such as public art, water features, and historical markers. Consistent themes in the use of these design features shall be used throughout. (4) Parking Facilities. Parking, loading and service areas shall be designed and located so as to minimize their visual presence in the center, present an attractive facade to neighboring uses, minimize the impact of expansive parking areas along pedestrian-oriented streets and active use areas. (a) Parking facilities shall be located behind buildings facing public streets, limited along all street frontages, and screened where visible to reduce visual prominence and visibility of parked vehicles, to the same extent required by PMC 20.31.027. (b) Parking and loading facilities shall be designed and located to enhance pedestrian safety through the use of pedestrian walkways delineated by distinctive pavements. (c) Recognizing that the area will support a mixed set of uses that will facilitate walking between uses and that multi-modal transportation options will serve access to the center, reduced parking standards will be implemented to minimize land dedicated to parking facilities. (d) Bike racks (as required by Chapter 20.55 PMC and PMC 20.31.030(4)) shall be provided in convenient, weather-protected locations; office and retail development are encouraged to consider providing showers and locker/changing rooms to support bicycle commuting by employees. (e) Internal parking lot landscape islands shall be designed to maximize tree canopy coverage growth to mitigate the urban heat island effect and reduce the visual impacts of surface parking lots. See the city’s vegetation management standards manual (VMS), Type IV standards, for further design details. The goal is to achieve large, functional canopy in parking areas. (Ord. 3132 § 1 (Exh. E), 2017; Ord. 2993 § 3 (Exh. H), 2011). (1) Upper Floor Stepbacks. The upper floor stepback of a building three stories or taller shall be a minimum of 10 feet. Alternatively, a total 10-foot step may be accommodated over multiple stories (e.g., seven feet on third floor, three feet on upper floor). Upper floor windows shall be a variety of shapes and sizes with multiple recesses and framing utilized. Stepbacks can be accommodated through exterior porches, balconies or other usable space along public street frontages to reduce the scale of larger buildings. Special attention shall be given to building location and shadowing which may impact solar access. 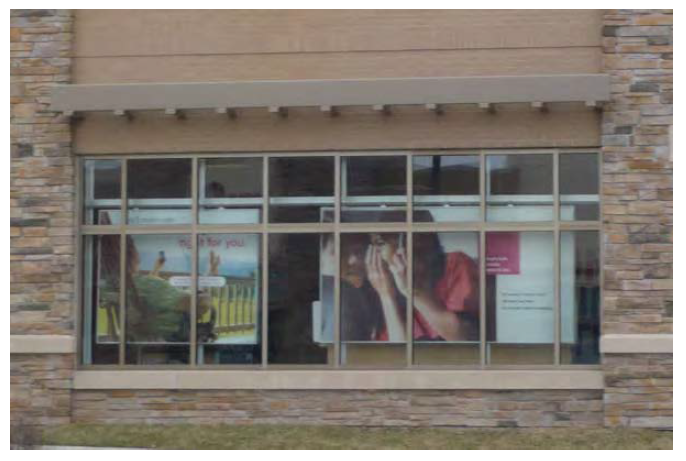 (a) The first floor of any street (and Riverwalk Trail in the RMX zone district) facing building shall be at least 12 feet in height – preferably 14 feet – as measured from the floor to the interior ceiling to provide for interior space suitable for retail, commercial services and restaurant functions. (b) The ground floor of a street or trail facing facade shall consist of at least 60 percent visual transparency along the exterior wall area located in the pedestrian view plane, defined as the horizontal area between two feet and eight feet above the exterior grade, and shall not be coated with a reflective or opaque covering/coating. (c) At least one building entrance shall be directly facing the sidewalk or trail and shall be publicly accessible and of architectural prominence. Additional access doors may be oriented toward parking lots. At least one building entrance shall be oriented toward the Riverwalk Trail when a building abuts the trail system in the RMX zone district. Transparent entries shall be used throughout. (d) Windows shall be trimmed using detailed/ornate and pronounced materials when looking at the finished facade of the building and the windows themselves shall be inset as to create depth and dimension to the facade. Decorative lintels, sills, molding, or framing details are required around all windows and doors located on facades facing or adjacent to public streets. Window openings on brick, stone, cast stone, or synthetic stone buildings do not need to be trimmed. Lintels, sills, and arches are not considered trim; window openings surrounded by stone work shall include windows with frames at least two inches wide. Window includes window frames in excess of 2 inches and is not trimmed due to being surrounded by stone siding. Windows are recessed to create depth in the facade. (3) Building Modulations. Buildings designed with completely flat facades and monotone color schemes are not permitted. All buildings are required to have horizontal and vertical facade variations such as pop-outs, bays, recesses, arches, banding, columns, or similar features. Such features are required at least every 30 feet along all exterior wall planes and shall be offset at least four feet. The building facade modulates with pronounced inset and bump-outs along the entire length of wall frontage. (4) Building Articulation. Buildings shall incorporate articulation on all sides. The street-facing side(s) shall receive the greatest amount of attention with respect to richness of forms, details, materials, and craft. (5) Blank Wall Treatment. Treat any facade with walls containing an area with over 30 feet in length or 400 square feet in area with multiple building materials of varying colors, textures and/or accents or through the use of painted murals, or other artwork. Alternatively, a planted trellis at least seven feet tall and 10 feet wide placed every 10 feet within a minimum five-foot irrigated planting bed. Climbing vines, columnar conifer trees/shrubs and/or other ground cover/shrub grouping shall be planted with the intent to screen the blank wall area. Buildings shall be designed to ensure that they look like the same building on all sides. Consistent or complementary building details and proportions on all sides ensure a “four-sided” quality to a building, but a building is not hereby prohibited from having more than four sides. (6) Building Materials. On one- to-two-story structures, cover a minimum of 30 percent of the building facade with a minimum of two exterior building materials. On structures three or more stories tall, cover a minimum of 40 percent of the building facade with two distinct building materials and a minimum of 60 percent with a third material. Building material texture and contrasting/complementary colors are encouraged. 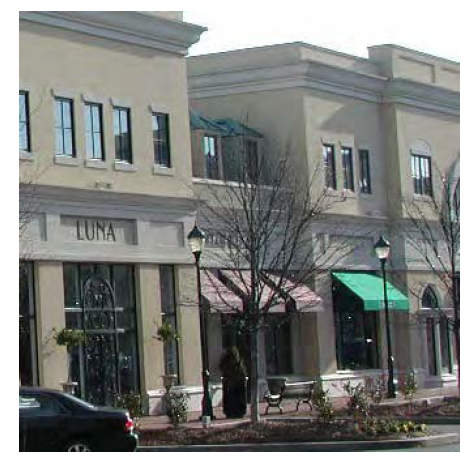 The use of stucco siding shall be minimized throughout and the use of metal paneling, brick, decorative faux stone, masonry, and masonry veneer shall comprise a minimum of 60 percent of the exterior facade, excluding gables, windows, doors, and related trim, throughout; all stone, masonry or faux mason materials shall be used in the lower portions of exterior walls. Horizontal changes of material from brick or stone to another material shall include a stone cap or a brick sill; the cap or sill shall project from the face of the building. A vertical change of materials shall occur at an interior corner or shall not occur within four feet of an exterior corner. (7) Required Parapets and Cornices. All flat roofs shall have a parapet and a cornice on all facades or walls. Flashing at the top of a parapet shall not qualify as a cornice. Cornices shall be in proportion with the size, scale, and architectural detailing of the building, and shall be decorative/ornate in nature. Buildings shall only be required to provide parapets and cornices on street-facing facades and walls. Cornices shall return at least eight feet around corners that transition from a building wall that requires a cornice to a building wall that does not require a cornice. (a) The height of the visible roofline must change at least four feet if the adjacent roof segments are less than 50 feet in length. (b) The height of the visible roofline must change at least eight feet if the adjacent roof segments are 50 feet or more in length. (c) The length of a sloped or gabled roofline must be at least 20 feet, with a minimum slope of three feet vertical to 12 feet horizontal. (Ord. 3132 § 1 (Exh. E), 2017; Ord. 2993 § 3 (Exh. H), 2011).